Buy or Rent from Independent Vision? Independent Vision (Mere) Ltd is an innovative company offering people with a visual impairment a number of different products to Buy or Rent. 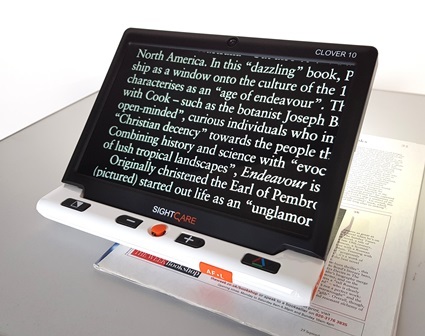 Electronic magnification has helped many people with low vision regain a level of visual independence that is not achievable with conventional magnifiers. People with sight impairment often benefit from using this equipment but can find the capital outlay restrictive.. The equipment may become unusable as your functioning vision changes. Hiring of equipment provides a solution. It allows the user to change the equipment to suit their needs. Independent Vision offers a FREE trial period, with no commitment to trial our products. A choice can then be made whether to rent or buy. Independent Vision delivers training on all products hired or purchased from Independent Vision. To find out more about the products and services we offer please contact us.